The online version of this article ( https://doi.org/10.1186/s40168-019-0671-0) contains supplementary material, which is available to authorized users. The interaction between plant and microbial communities drives the maintenance of biodiversity, community stability, and ecosystem functioning . Phyllosphere fungi are an important component of microbial communities; they include both epiphytic fungi inhabiting leaf surfaces and endophytic fungi living asymptomatically within leaves, and are of high species diversity and play major roles in ecosystem functions [2, 3, 4, 5]. For example, endophytic fungi can promote plant growth and resistance to biotic and abiotic stresses, such as pathogens, drought, and salinity [2, 6, 7]. In addition, epiphytic and endophytic fungi can contribute to leaf litter decomposition and play an important role in recycling carbon and nutrients in ecosystems [8, 9, 10]. Thus, elucidating the relationship between plants and phyllosphere epiphytic and endophytic fungi is of great importance if we are to understand biodiversity maintenance, community stability, and ecosystem functioning. Phyllosphere epiphytic and endophytic fungi occupy two distinct microenvironments: epiphytic fungi are in contact with the external environment, and depend on nutrients deposited on leaves from the atmosphere or those exuded from leaves , whereas endophytic fungi are in contact with the plant’s inner environment and absorb nutrients from host tissues . Plants are therefore presumably able to exert more control over the fungal colonization of internal tissues than that of exterior surfaces . For example, some studies have shown that plant identity significantly affects endophytic fungal diversity and community composition [14, 15, 16, 17, 18]. By contrast, some studies have demonstrated that plant identity has no or weak effects, on epiphytic fungal diversity and community composition [19, 20]. Furthermore, previous studies have shown that the diversity and community composition of phyllosphere epiphytic and endophytic fungi are different [13, 21, 22, 23]. Recently, based on re-analysis of previously published datasets of biotrophic plant-fungal associations, it has been suggested that nestedness decreases but modularity increases with increasing specificity , whereas nestedness increases but modularity decreases with increasing connectance . However, most previous network studies on fungi have focused mainly on belowground mycorrhizal mutualistic networks, which vary among different mycorrhizal types and different ecosystems [32, 33, 34, 35, 36, 37, 38, 39, 40]. By contrast, the network structure of plants with endophytic and epiphytic fungi is less well documented [31, 41, 42]. For example, Ikeda et al. revealed that the network of endophytic Xylariaceae and woody plants in Japan showed significant specialization. Chagnon et al. 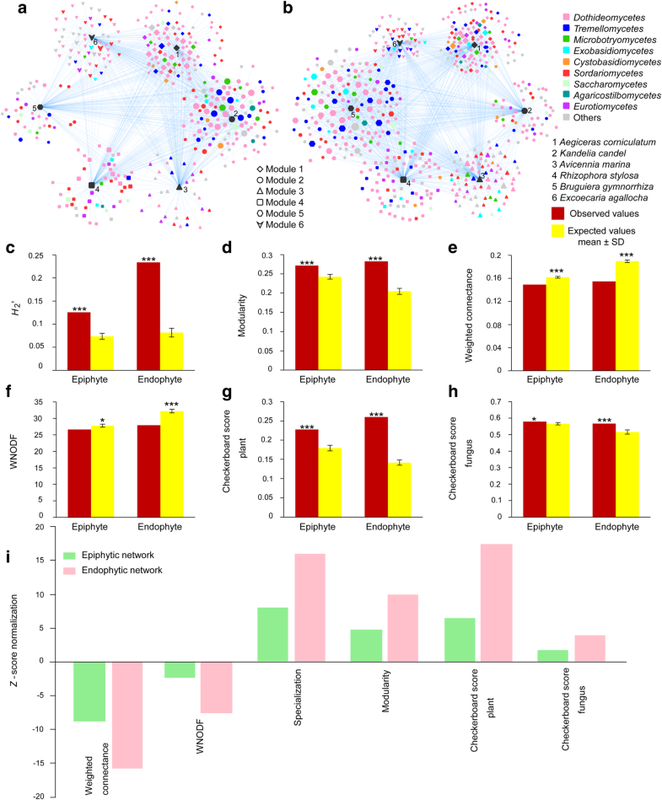 found that the endophytic networks of plants were less nested, less connected, and more modular than endolichenic networks across five sites in North America and suggested that plant hosts could select more strongly than lichens for a specific subset of fungal partners. In addition to interaction types, interaction intimacy (i.e., the degree of biological associations between partners) can lead to differences in network organization; that is, increasing intimacy can promote specialization, leading to networks characterized by compartmentalization, whereas weak intimacy can lead to nested networks . 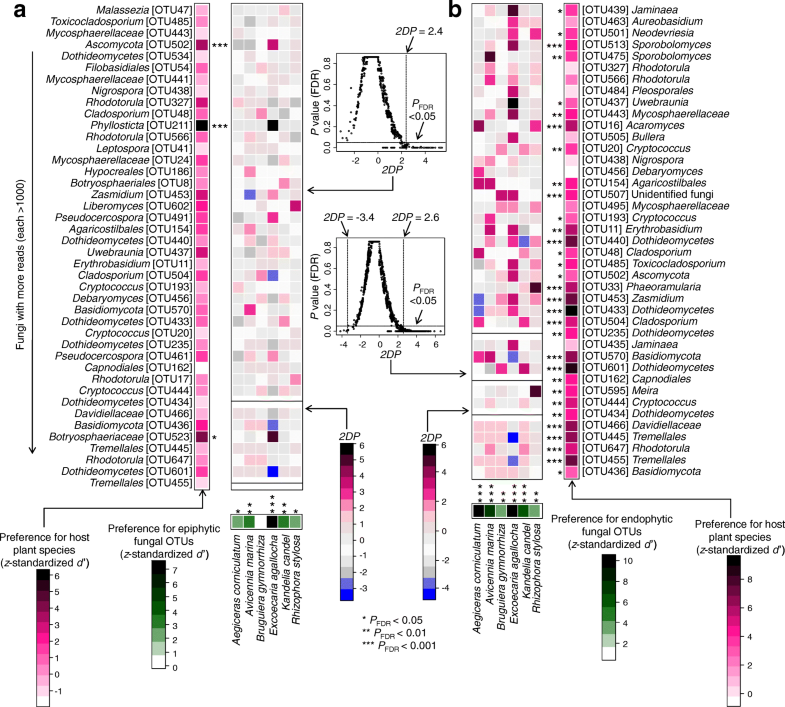 This study showed that the community composition of epiphytic and endophytic fungi was significantly different, as reported in previous studies [13, 20, 21, 22, 23, 50]. This difference may be caused by the distinct leaf microenvironments where epiphytic and endophytic fungi live, as mentioned above [13, 17, 22, 56]. In fact, we found that 18.7% and 40.8% of the total OTUs were unique epiphytic and endophytic fungi, respectively (Additional file 2: Figure S3). For example, members of genera Curreya, Peniophora, and Cytospora were exclusively epiphytic, whereas members of genera Auriculibuller, Yamadazyma, Pseudoplectania, and Simplicillium were restricted to the role of endophytic fungi (Additional file 1: Table S1). 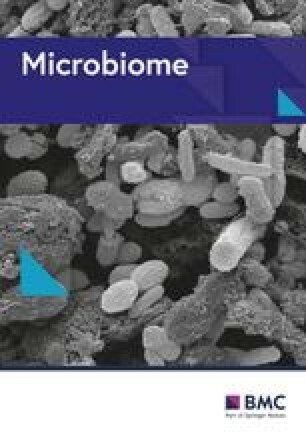 Similarly, members of Yamadazyma, Pseudoplectania, and Simplicillium were also reported as endophytic fungi in previous studies [46, 57, 58]. In addition, some relatively abundant fungal OTUs had biased occurrence in epiphytic and endophytic fungal communities, for example, some OTUs (e.g., Rhodotorula OTU17, Phyllosticta OTU211, and Dothideomycetes OTU601) were significantly relatively more abundant in epiphytic fungi than in endophytic fungi, while some OTUs (e.g., Jaminaea OTU439, Neodevriesia OTU501, and Ascomycota OTU502) were significantly relatively more abundant in endophytic fungi than in epiphytic fungi in this study. 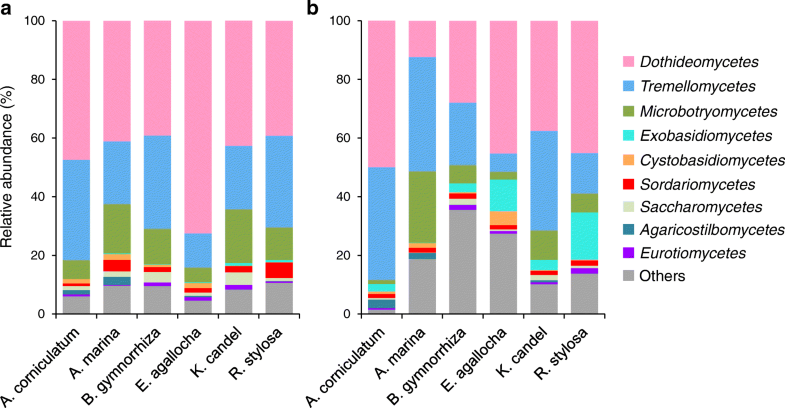 We found that plant identity significantly affected the community composition of both epiphytic and endophytic fungi, as reported in some previous studies [14, 15, 16, 17, 18, 21]. 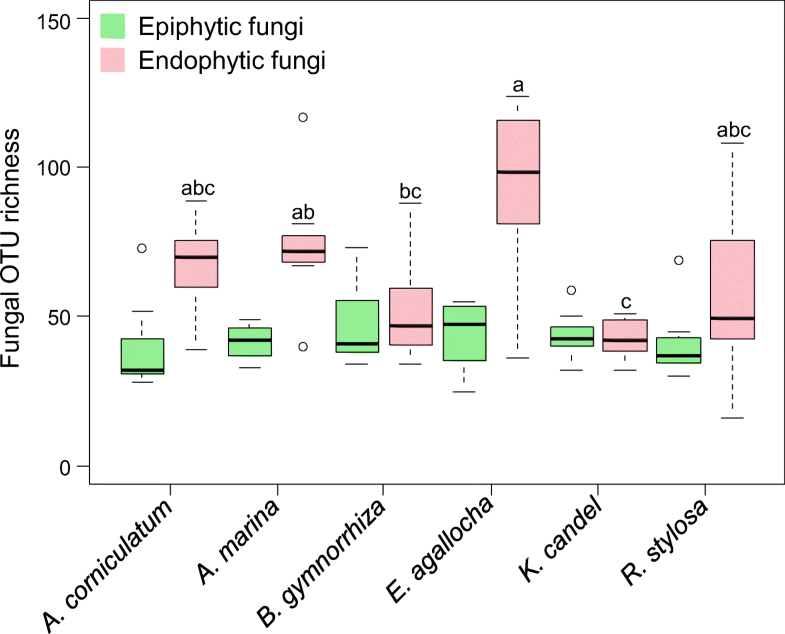 Furthermore, plant identity had a greater effect on the community composition of endophytic fungi than that of epiphytic fungi in this study. One possible explanation may be that endophytic fungi are filtered more by host plants, whereas epiphytic fungi are more affected by environmental factors as mentioned above [13, 17, 22, 56]. 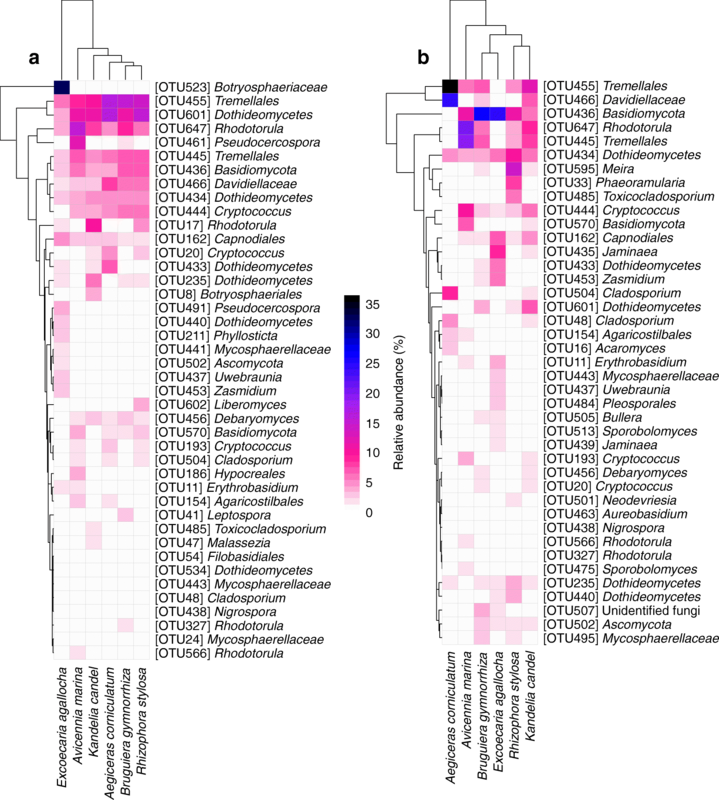 In addition, our findings may be due to differences in host/fungus preferences, as our host/fungus preference analysis demonstrated that more endophytic fungal OTUs showed significant preferences for hosts than did epiphytic fungal OTUs (32 vs. 3), and more host species (6 vs. 5) showed significant preferences for endophytic fungi than for epiphytic fungi. 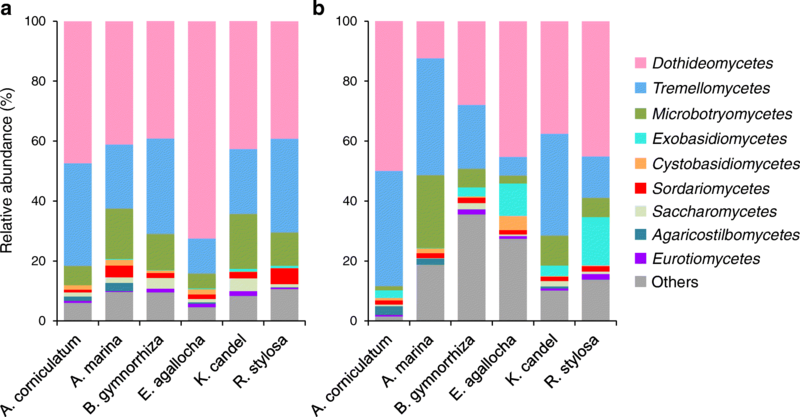 In addition, more pairs of plant species and endophytic fungi than that of plant species and epiphytic fungi (23 vs. 8) showed significantly strong preferences. Moreover, our checkerboard scores analysis indicated that negative species interaction was stronger in endophytic than in epiphytic fungal communities, as competitive interaction can affect the fungal community assembly process, in that the presence of early-arriving fungal species has a negative influence on the ability of later-arriving species to colonize hosts .